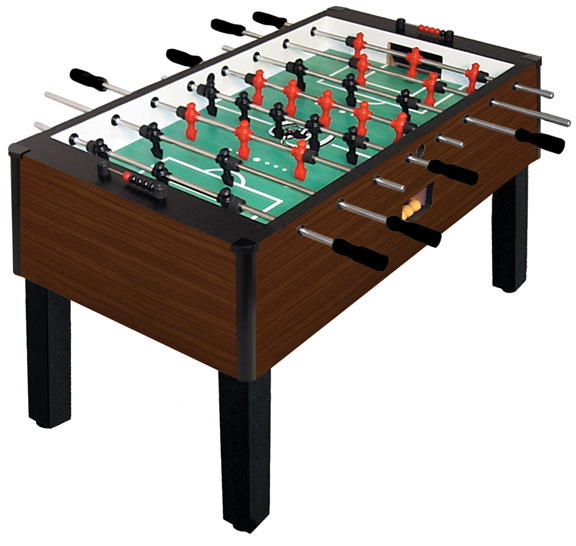 One of my favourite things about my job is lunch time, and not because it is a break from work, or even because it is time to eat, but the reason I enjoy lunch time at work so much is that when there are at least four IT people around, we can get a game of foosball going. Foosball or table soccer, is a great game for the twenty or so minutes we have left at the end of our lunch once we have eaten. In the last ten months, I’ve gone from being completely useless and skill-less at the game to being a mid-level player. I went from having people sigh when I was on their team, to being one of the people picked. It is a really nice feeling, a super fun game, and actually requires much more skill than I had ever thought. I was very lucky though as one of the players is highly skilled, and I was able to watch him closely to learn some of his moves. He does very specific things that no one else does and they work more often than not. Pretty much anyone that plays as his team mate wins. I used to fight against Sabine wanting a table for our own, but now that I’ve seen how much fun it is… I might end up buying one someday. Today, we had some great games. Out of three games, I won only two, and the other was super close (10:9). Some games can be as short as five minutes, and others can last almost twenty. Shamefully enough, I even work up a bit of a sweat as I focus in on the game, and really try to get my hand/eye coordination going on super speed. If you’ve never played a four person game of foosball, I’d recommend you find a way to try it out. It might not be much fun the first time, but if you play it reasonably consistently for a month, you’d be amazed at how much skill you can pick up.